Every year, EAPPI joins Palestinian farmers in the olive harvest. Our protective presence helps farmers access lands near settlements or in areas cut off by the wall and also helps deter acts of Israeli settler violence against Palestinians and their olive trees. In this photo essay, we show various views of olive harvest in Palestine. EAPPI observers participate in the olive harvest in Susiya. Often our presence allows farmers to pick their olives in places under threat of settler violence. Photo EAPPI/B. Rubenson. Olive trees hold a strong symbolic value in Palestinian culture. Not only do they represent livelihood and community bonds, but also olive branches are a symbol of peace. Photo EAPPI/R. Kolehmainen. A symbol of peace. Photo EAPPI/A. Aguilar. EAPPI also joined olive farmers in Far’ata, in the district of Qalqilya. Photo EAPPI/A. Aguilar. The olive harvest in Palestine is a community event. Over lunch, the farmers and volunteers strengthen their bonds of friendship. Photo EAPPI/ A. Aguilar. Abu Ra’ed, a farmer in Kafr al Labad makes tea for the harvesters. Photo EAPPI/A. Aguilar. The idyllic atmosphere of the olive harvest is often interrupted by the presence of the Israeli army. In Kafr al Labad, near Tulkarm, Israeli soldiers watch the olive harvest. Photo EAPPI/A. Aguilar. Sadly, a wave of Israeli settler attacks marred the olive harvest this year, as it does many years. Here Israeli settlers set fire to a field of olive trees in Jalud. Photo EAPPI/F. Djurklou. A boy avoids inhaling smoke after Israeli settlers set fire to a field of olive trees in Jalud on October 9. Photo EAPPI/O. Devine. Again, in Qaryut, Israeli settlers cut the branches from 60 olive trees. Photo EAPPI. Destruction of olive trees is devastating for the Palestinian community. “The trees are a very important income for us,” described Wsafe Jeaber, one of the Qaryut residents, “You don’t know how much I cried when I saw the trees; only wood and no olives. These trees feed me, my husband and three children.” Photo EAPPI. An Israeli activist from Ta’ayush plays with a 3 year old Palestinian boy during the olive harvest in Susiya. A reflection of the peace to come. Photo EAPPI/M. Ward. Once the picking is done, an EA helps a farmer gather the fruit of their labor. Photo EAPPI/A. Aguilar. An EA helps clean and gather olives. Photo EAPPI/C. Jones. Despite the difficulties of occupation, the olive harvest remains an important and joyful cultural event in Palestine. 3 boys enjoy a photo break during the olive harvest in Beitillu, near Ramallah. Photo EAPPI. What is the European Union doing for Palestine, and what should it be doing? EAPPI observers actively involved in relaying facts on the ground from their eyewitness experience to the EU delegation in Jerusalem. 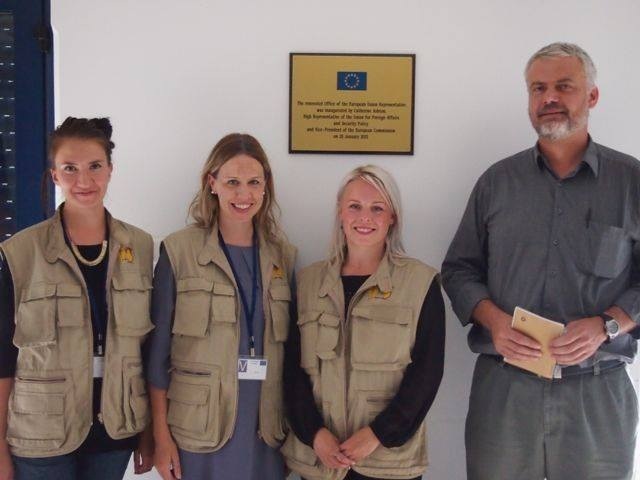 On Monday, October 12, we visited, with 2 other EAPPI colleagues, the Office of the European Representative for the West Bank and Gaza in East Jerusalem. Our mission – to present our work and discuss EU policies in the region. In our meeting, the EU delegation representatives explained that the EU is helping the Palestinian Authority build institutions for the future independent and democratic Palestinian State and working to enhance economic and political cooperation with the EU. All of these efforts are based on the EU’s Interim Association Agreement on Trade and Cooperation. The Lithuanian Presidency of the EU Council recently called on Israel to “end the settlements”, stating that they undermine the peace process. Such an active stance is encouraging. Despite these positive developments, we’ve seen many counteractive actions and took the opportunity to share with the EU delegation what we have seen in our 3 months. We discussed the rise in house demolitions in Area C. The UN recorded at least 8 demolitions in Palestinian villages since mid-August, including the demolition of Az Za’ayem Bedouin village, which we witnessed with our own eyes. This is only one example of a demolition in the E1 area, which will displace over 2,300 Jahalin Bedouins from the area east of Jerusalem. 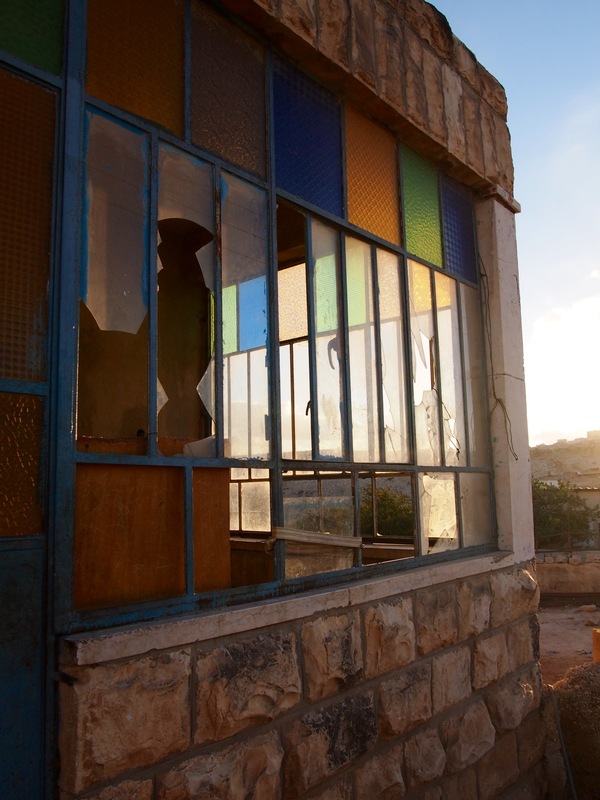 We pointed out that many EU funded buildings are those that are demolished, as was the case in Khirbet al Makhul. The Association of International Development Agencies in Jerusalem, reported in May 2012 that the Israeli authorities demolished 30 European funded structures between March to May 2012 alone. We expressed concern over the steady expansion of illegal Israeli settlements in the West Bank, and the continuation of this expansion, despite current peace talks. Since 1967, Israeli has allowed the creation of over 150 settlements and 100 settlement outposts. We shared the situation of settlement expansion in Hebron, in which Israeli settlers aim to move into the Rajabi building. If allowed, they will create a new settlement in Hebron, which will link the settlements of Kiryat Arba and Givat Ha’avot to the Israeli settlements in the Old City of Hebron. This new settlement will also have a devastating humanitarian impact on the local Palestinian community. 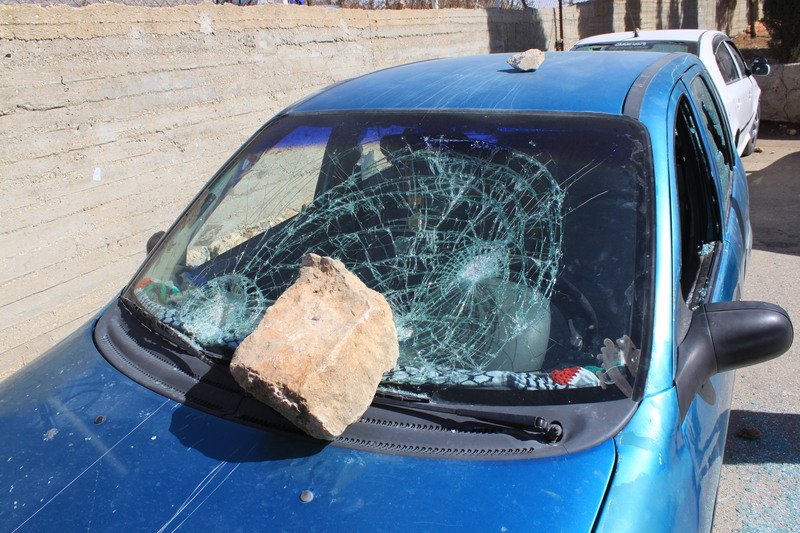 We showed pictures of settler attacks against Palestinians; the burning of more than 400 olive trees in Jalud and pictures of windows of several buildings in the Jab’a Bedouin community that settlers damaged with stones. What the EU must do? Consistency and determination is required from the EU and its member states in policies towards supporting the development of a future Palestinian state and peace in the region. As a major market for agricultural products from Israeli settlements, the EU helps sustain settlements, making them viable and profitable. This reality, necessitates that the EU fully implement its new guidelines, which will come into force on 1 January 2014 and ensure that Israeli settlements are not benefitting from trade with the EU. Recent speculations reveal that the guidelines may not be fully implemented after all, due to the political dismay they caused in Israel and in order for Israel to be able to participate in the EU’s Horizon 2020 financial instrument. We expressed our concern and emphasized that the Horizon 2020 programme must not happen at the expense of human rights. Respect for human rights, democracy and the rule of law are core values of the European Union embedded in the charter of fundamental rights of the European Union. These values are binding to all 28 Member States. While EU policy making does not happen on the delegation level, we know they are important avenues in relaying facts from the ground to the corridors of Brussels’ institutions. “Europeans are finally beginning to understand the situation in Palestine, we welcome their efforts to help and we welcome the guidelines,” the headmaster of Al-Fakheit school in Masafar Yatta recently told us. We share his welcome and are glad we could portray the effects of the Israeli occupation on the everyday life of the Palestinians.